We ended up having a really good heart-to-heart on Friday night, and were blessed with three nights of easy bedtime routines for Seth (we've decided to prep for the toddler bed); a great family day on Saturday with a trip to Costco and chores around the house; and since our Sunday School teacher was AWOL at the Bristol Nascar race, we had a leisurely Sunday morning with strawberry french toast and some snuggle time in bed with Seth. I'm willing away the next several hours until I can head in for my obgyn appointment. My excitement is two-fold. My dear friend Sarah and I have back-to-back appointments, so I will FINALLY get to see her and meet her infant daughter Anna Claire. Due to Anna Claire's early arrival, we haven't had the chance to get together since her birth, but tomorrow, I'll finally get to get my hands on that lil peanut. As I mentioned earlier, I have just a couple things that I need to share with Dr. Morgan about how I've been feeling (physically) for the last few weeks. I'm hoping, or course, that all is well, but that she will want to order an ultrasound, just to check on things from the inside. If not, I'll have to be satisfied with the doppler heartbeat until our "big ultrasound" in April. 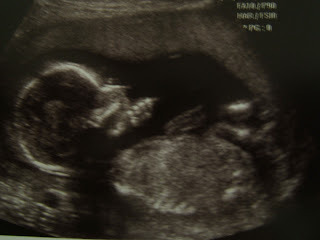 This is a shot of Seth at 16w2d, exactly how far along I am today. Look at that little profile! Wasn't he gorgeous, even this early? And so smart -- look at that thoughtful pose! Anyway, I should take advantage of his sweet slumber right now -- it's nap time as I type -- and catch some rest myself. Spring has definitely sprung here in TN, and my allergies are not happy. Maybe a little snooze of my own will help. I'll be back tomorrow with an update on Itty Bitty. I applaud you for writing such an honest post the other day. I hope that you are feeling better and that your appt. tomorrow goes great. I'm looking forward to your update and will be praying for you. I am SO glad that you and Sarah will be able to meet up and that you will have a chance to meet Anna Claire. David and I are EXACTLY the same. Sometimes, if I don't feel I will be able to articulate out loud what I am feeling face to face, then I will email him. Even if I am upstairs and he is downstairs. I will walk up to him, hand him the laptop, and say "check your email". I got the strangest look from him the first time I did it, but it works for us. I can get out everything I am feeling without worrying about being interupted or trying to read his face, or getting lost in my own words...I write so much clearer.